The Masur Museum of Art’s Annual Juried Competition showcases contemporary artists throughout the United States of America working in any medium. This long running juried competition also showcases some of America’s best curatorial talent. This year 259 artists, representing 40 states and South Korea, entered 721 works of art for consideration by our juror. From that group, juror Joel Parsons selected 62 works of art by 47 artists representing 22 states. Our exhibition will truly give you a sense of best studio practices by artists working all over the country. The members’ reception for the 55th Annual Juried Competition will be Friday, August 24, 5:30-7:30pm. Prizes will also be announced and awarded at that time. The exhibition will still be open to the public during normal museum hours from July 12 – Oct 13. The 55 th Annual Juried Competition is sponsored by CenturyLink. National Endowment for the Arts. Additional support is provided by a grant from the Louisiana State Arts Council through the National Endowment for the Arts as well as the Louisiana Division of the Arts, the Northeast Louisiana Arts Council, CenturyLink Security Systems, Yellowbook360, and DeltaStyle. 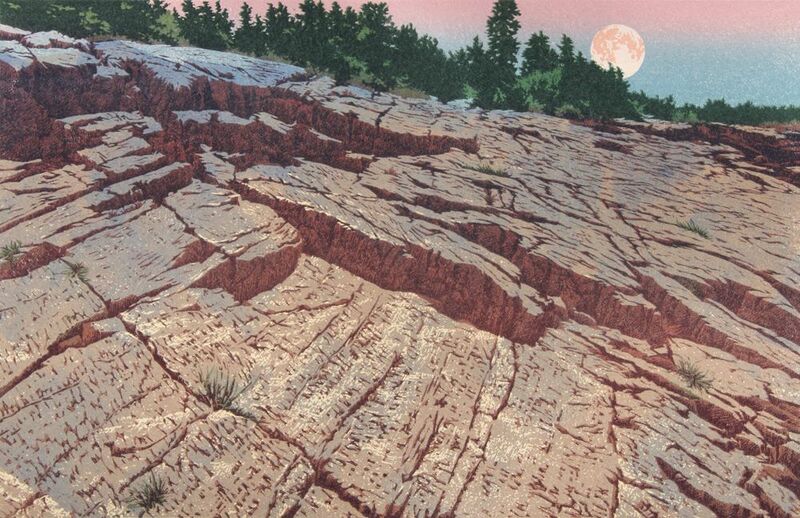 The accompanying image is from artist William Hays, Acadian Moon, 2017, Linocut print. Courtesy of the artist. Joel Parsons is a curator, artist, and teacher based in Memphis, where he is the Director of Clough-Hanson Gallery at Rhodes College and Assistant Professor in the department of Art and Art History. His curatorial practice is often collaborative and driven by a desire to bring institutional resources to bear on conversations of equity and marginality. Recent projects include The Weight of Hope, No Fate But What You Make: Art and Queer Spirituality, Faith Wilding: Fearful Symmetries, and Rashayla Marie Brown: Supreme Being. He is the founder and co-director of Beige, an alternative gallery and performance space devoted to the work of LGBTQ artists. He is the Co-chair of the ArtsMemphis Artist Advisory Council and serves on the board of the UrbanArt Commission. As a Thomas J Watson Fellow in 2007-2008, he studied relational art practices in emerging global art centers. He received an MFA from the School of the Art Institute of Chicago. His artistic practice centers on queer intimacy, and has been shown at Yale University’s Greene Gallery; Western Exhibitions in Chicago, IL; and the Yerba Buena Art Center Triennial in San Francisco, CA.